Stratford Greenway follows the course of part of the Honeybourne Line. This was a single track railway line built in 1859 by the Oxford, Worcestershire and Wolverhampton Railway and closed in 1976. 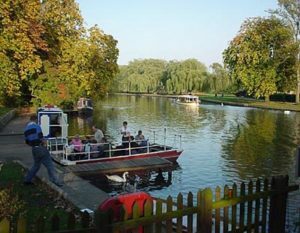 Stratford Greenway is now a 5 mile long permissive bridleway between Long Marston and Milcote in Stratford upon Avon and is a high quality surfaced path suitable for cyclists, walkers and wheelchair users. It also forms part of the National Cycle Network. One notable structure along The Greenway is Stannells Bridge, which looks very much as though it was made from Meccano and spans the River Avon. The stretch of water that this former railway bridge is over is called The Stannells. Stratford upon Avon is an ancient market town and is synonymous with the poet and writer William Shakespeare. For this reason it is one of the leading tourist destinations in the country. The parish church of Holy Trinity is a lively place, known as Shakespeare’s church and is an exceptional building and is said to be one of the finest in England. This ancient church provides a moment of calm from the bustle of the town and both the courtyard and the churchyard, set on the banks of the River Avon, are beautiful. Both William Shakespeare and Anne Hathaway are buried here. William Shakespeare, the Bard of Avon, was born in Henley Street, Stratford upon Avon in 1564 on St. George’s Day (23rd April) and died on the same day in 1616. The Records of Baptisms and Burial show that both of these events took place at Holy Trinity Church. Mention of a church on this site is made in the Charter of 845, signed by Bertulf, King of Mercia. This would have been a wooden construction, and it is very likely that the Normans replaced this with a stone building, but no trace of either remains. The present limestone building was begun in 1210 and was built in the shape of a cross. Stratford Greenway is as above, but with the addition that at the Milcote start there is The Carriages Café 5344. 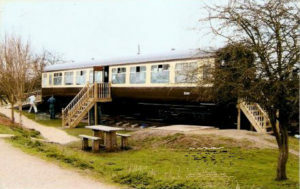 This can be found at the Milcote Picnic Area and the café is set inside a restored original 1967 GWR Railway Carriage. Luddington is a small drawn-out village with houses set close to the road that passes through it. The village was part of the Ragley Estate belonging to the Marquis of Hertford. The village green, around which many of the village activities are centred, is now the only remaining land that still belongs to the Ragley Estate. Luddington Village Conservation Area. The recently refurbished Luddington Village Hall, which was built in 1953, is also at this end of the village. There are several half-timbered properties including the former Methodist Chapel, which was opened in 1932 and can be found adjacent to and set back from No. 199, almost opposite All Saints Church. All Saints Church is accessed along an avenue of lime trees and is a small Victorian church, built in 1872 and set in a beautiful location next to the River Avon. The churchyard overlooks the moorings and the 17th century lock which is managed by the Avon Navigation Trust. There is also a Garden of Remembrance within the churchyard, with seating for those who want some quiet time in a lovely spot. Luddington is refuted to be the meeting place of Anne Hathaway and William Shakespeare, as Anne was from the parish. There is also some evidence that they married in 1582 in the original church, which was in a different part of the village. Unfortunately the original church, along with all the records, burnt down in the 19th century. Binton has four entries in the Doomsday Book of 1086. Binton Manor was bought by Edward Viscount Conway of Ragley Hall in 1670 and the title remains in his family. In the 19th century, the Conway’s possessed most of the village and proceeded to build the present church in 1875, on the site of a much older one. Records show that here has been a church on the site since at least 1286. A picture of the original church can be seen at the back of the current church. Signs of the original church remain. There is a 15th century font and cover and a medieval chest with 3 locks and bound with iron bands. By the gate to enter the churchyard, there are steps built into a wall, so as to avoid using the gate. The purpose of these was for people arriving to church by horseback could easily dismount; there is still a ring by these steps where horses could be tied. The main feature of St. Peter’s Church is a memorial window by Kempe (1915) dedicated to Robert Falcon Scott and his co-explorers who died in their failed attempt to return from the South Pole. The window shows four scenes of the 1912 expedition. Robert Scott had married Kathleen Bruce, sister of the Reverend Bruce, Binton’s rector from between 1906-24. Alongside the window is a memorial cross for the Reverend Bruce. The other former place of worship in the village is the Congregational Chapel, built in 1871 and now a private residence, and can be found a little further along Main Road from the Old School, but on the opposite side of the road. One of Binton’s most notable features is the ‘well’ which William Jackson and his wife, who lived in ‘Springback’, now called ‘The Old Wellhouse’. This is to be found on the other side of the road, opposite the main gates to the church. 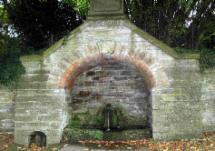 Jackson provided the stone wellhead known as ‘Buckwell’ or ‘Lion’s mouth’ by piping water from a well in his own garden into the watering hole we now have. Road, there was a railway station. The school, shop, Post Office, public house, forge and the railway station no longer exist. Notable buildings in the village include The Grange (formally The Rectory) found next to St. Peter’s Church and the Old School building, now the Village Hall and situated along Main Road. Binton Social Club is at the top of the village sitting upon a hill, which affords magnificent views over the surrounding countryside. The club is probably the oldest licensed club in the British Isles. It was originally an agricultural barn with a cottage attached, owned by the Marquis of Hertford of the Ragley Estate. The area around the club can be used for visitor car parking.